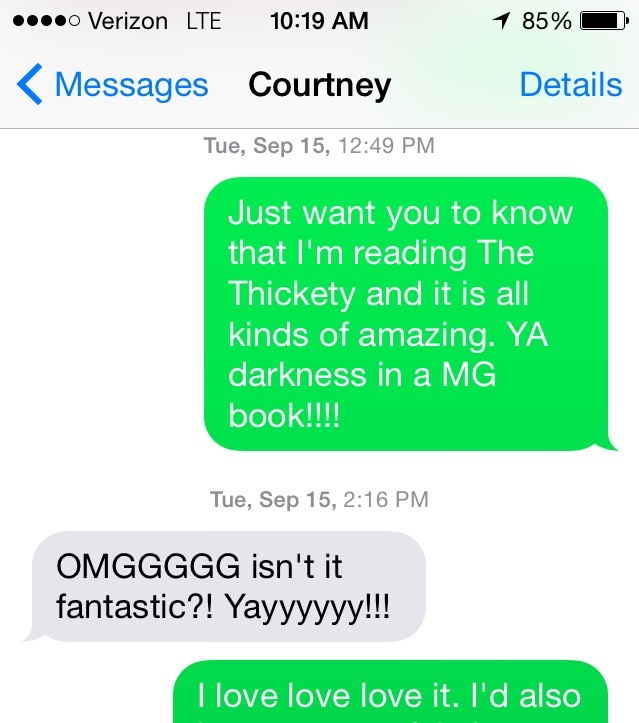 Hence the case of The Thickety books, brought to my attention by my super awesome fellow bookseller classmate Courtney (of the text exchange) and seconded by equally fab classmate Emily. Kara is looking for a way to help her sickly little brother when she's led into the Thickety, the dark and evil forest where the demon Sordyr resides, and discovers a grimoire. The grimoire gives Kara great powers--but it also gives another girl, cruel Grace, different and equally great powers. Soon Kara finds herself locked in a battle of magic and wits with Grace, all the while trying to discover just who her mother was and what it is that Sordyr wants with her. As I said above, the first reason I loved this book is that it's a MG novel with YA levels of darkness and it's confidently, deliciously dark. I haven't seen anything like this since The Last Apprentice--and I'd argue that White's writing and descriptions and storytelling are better than that in The Last Apprentice books. Even though I'd be cautious about who I'd sell this book to in the bookstore, I think that White has a keen sense about who is audience is and how much creepiness they crave and can actually handle. He knows when to describe the eerie, scary, unsettling things, and he knows when to pull back and let the reader fill in the rest with their imaginations, which is not an easy thing to intuit. The plot is tight. White skillfully sets up the microcosm of this island and their pseudo-religious beliefs and superstitions, the looming Thickety with the evil that lurks within, and Kara's longing to help her brother and conform conflict with her desire to know who her mother actually was. Kara's indulgence in magic and her inability to resist its magnetic lure is something that many young readers will likely identify and delight in, even as they can tell she's getting pulled in over her head. As the truth about the nature of her powers slowly emerges, Kara is confronted with some hard decisions and her actions propel the story to a startling climax. The twists keep coming, all the way to the very end of the novel, leaving readers with big questions about the fate of Kara and her family. 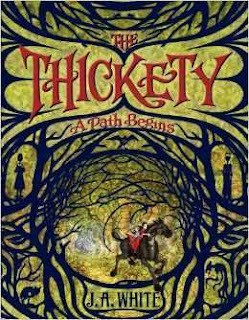 But the sequel, The Thickety: The Whispering Trees, is available now! Don't do what I did, which is look at a copy of books two, think about buying it, end up not doing so, regretting it for weeks, only to finally succumb after much mental anguish. Just do yourself a favor and get both books. 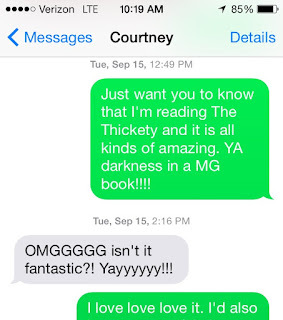 And pre-order book three while you're at it. You're welcome. Book purchased at Schuler Books & Music.